In my current role at Lightbend I’m investigating and pursuing opportunities where Reactive Streams can make the lives of Jakarta EE (the new Java EE) developers better. In this blog post I’m going to share some of the ideas that we’ve had for Reactive Streams in Jakarta EE, and how these ideas will benefit developers. Reactive Streams was adopted by the JDK in the form of the java.util.concurrent.Flow API. It allows two different libraries that support asynchronous streaming to connect to each other, with well specified semantics about how each should behave, so that backpressure, completion, cancellation and error handling is predictably propagated between the two libraries. There is a rich ecosystem of open source libraries that support Reactive Streams, and since its inclusion in JDK9, there are a few in development implementations that are targetting the JDK, including the incubating JDK9 HTTP Client, and the Asynchronous Database Adapter (ADBA) effort that have also adopted it. Before I jump into the specific parts of Jakarta EE where Reactive Streams would be useful, it’s worth talking about the overall picture. Reactive Streams is an integration API, or more specifically, a Service Provider Interface (SPI). It’s not intended that application developers implement the reactive streams interfaces directly themselves, rather, it is intended that the various streaming data sources and sinks provided by libraries, database connectors, clients and so on, implement reactive streams, so that application developers can then easily plumb those sources and sinks together. Doing a quick off the top of my head count based on my knowledge of existing specs that do streaming in Jakarta EE and the JDK, there exist no less than 10 different APIs that are offered by the various specs for streaming data either synchronously or asynchronously. These range from, of course, InputStream and OutputStream in the JDK, to NIO Channel’s, to the Servlet 3.1 ReadListener and WriteListener extensions, to the JDBC ResultSet, JSR 356 @OnMessage annotations, Message Driven Beans and JMS, CDI events using @Observes, Java collection Stream and Iterator based APIs, and finally, the new JDK9 Flow API. Each of these APIs streams data in some way, and offers varying levels of capability - some are synchronous, some are asynchronus, some offer backpressure and some don’t, some have well defined error handling semantics and others don’t. The problem arises when I want to connect two of these together. For example, if I want to emit CDI events on a WebSocket. Or if I want to plumb a stream of messages into a database. Or if I want to stream data from an HTTP client response to a servlet response. When the two APIs for streaming are different, then I have to write non trivial boiler plate code to connect them together. This even applies to connecting an InputStream and OutputStream, I can’t simply pass an InputStream to an OutputStream and say “here’s your source of data, write it”, I have to allocate a buffer, read and write in a loop making sure that I get the semantics and argument ordering correct, I have to ensure that I properly wrap things in try-with-resources blocks to ensure that things are cleaned up correctly even when there are errors, and so on. And all this for what should be the simplest of all use cases. It gets even more complex when we start integrating asynchronous APIs. What if the source is producing too much data for the sink, how do I tell the source to slow down? In some cases, the API’s don’t even offer a backpressure mechanism, in others, they do, but the mechanisms differ, we have interest based event APIs like NIO, we have on ready callback based APIs like Servlet 3.1, and we have token based backpressure APIs like JDK9 Flow. Connecting these together, especially given that these asynchronous APIs require concurrent programming, is unreasonable to expect application developers to implement and maintain for each permutation of APIs that need to interoperate. And so the high level reason for supporting Reactive Streams in Jakarta EE is in two parts. Firstly, it facilitates integration of Jakarta EE APIs with each other. Secondly, it facilitates integration of Jakarta EE APIs with third party libraries. To connect a Reactive Streams publisher to a Reactive Streams Subscriber is one line of code, publisher.subscribe(subscriber);, and in this single line of code, a developer can be confident that data flow, backpressure, completion handling and error handling are correctly handled. So as we consider the individual specs within Jakarta EE and the use cases associated with them that Reactive Streams helps with, we should remember that each additional place where Reactive Streams is used in Jakarta EE increases the usefulness of Reactive Streams in other parts of the spec. In my use cases below I’ve tried to focus on use cases that are interesting today in and of themselves, assuming no other changes are made to support Reactive Streams. For each use case that does get implemented, the usefulness of Reactive Streams will multiply. It is a common use case for an application to store or transfer files, sometimes large files, perhaps hundreds of megabytes in size. And a very common place to store these is in an object storage service, such as Amazon S3. Let’s imagine you have an expense reporting application, and each expense must have an associated scan or photo of a receipt, so your application offers the ability to upload and download these receipts, using Amazon S3 to store them. A unique thing about a request to upload or download large files is that such a request is long running. It can take minutes to upload or download a single file - consider someone trying to use the dodgy airport wifi to upload a receipt for a meal they purchased at the airport, uploading their 4mB image at 20kB/s. That single upload will take over 3 minutes. Using the existing blocking APIs offered by the servlet API requires each upload consuming a thread from the servlet containers thread pool for the duration of the upload, 3 minutes. Threads are a very limited resource. Each thread requires up to a few megabytes of memory allocated for it stack (depending on configuration and use), you can’t just go create more threads when you need them because they are expensive. For this reason, servlet containers use pools of threads, a typical configuration is to have a pool of 200 threads. With 200 threads, that server would only be able to serve one upload of a receipt on dodgy wifi per second before the server exhausts its thread pool and starts rejecting requests. And that’s not including any other requests the server has to handle. This is dismal performance, and a very inefficient use of resources. As you can see, the line of code needed to connect the servlet request body stream to the HTTP client request body stream was .POST(BodyPublisher.fromPublisher(req.getPublisher())). That’s 180 lines of non trivial concurrent code in the example I linked to above down to one line of trivial code, with built in handling of backpressure and completion/error propogation. Furthermore the code reads like the high level task that the developer is trying to achieve, literally “Post the body published from the request”. // bytes) to the HTTP client request body to S3. Similarly, other implementations of Reactive Streams can easily be used to handle the multipart request in the same way. The important thing that Reactive Streams allows here is that a developer can select whatever tool they want to handle which ever part of the stream they want, and be assured that end to end, all data, backpressure, completion and errors are consistently propogated. So far we’ve only looked at use cases that deal with streaming bytes for IO. Reactive Streams is also very useful for streaming high level messages, such as those produced and consumed by message brokers. This is a fairly trivial example, but using Akka Streams, we could have the messages fanned out to multiple other consumers, we could have cycles in the processing that aggregate state, etc. WebSockets is another type of long lived connection where synchronous IO is not appropriate. The current Jakarta EE spec for WebSockets, JSR-356, does offer asynchronous handling of messages, however it does not support backpressure on receiving (so if the other end is sending too much data, there is no way to tell it to slow down, you must buffer or fail). It is also a purpose built API just for WebSockets, so any integration with other asynchronous data sources or sinks must be implemented manually by the end user. Now imagine we wanted to implement a chat room, perhaps we’re going to use Apache Kafka as our chatroom backend, with one single partition topic per room. 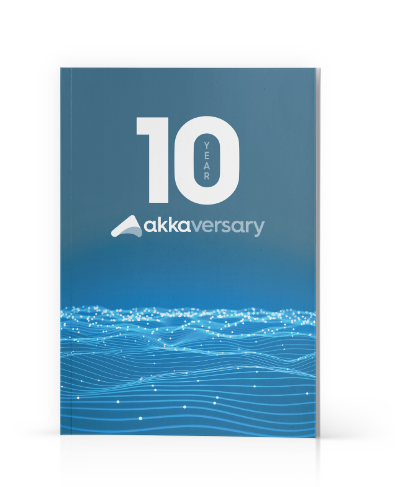 To implement this today, a reasonable amount of boilerplate is required, not just to transfer messages from the client to Apache Kafka and back, but also to propogate errors. Furthermore, if a client was producing messages at a high rate - faster than Apache Kafka is willing to consume, these messages are going to buffer on the server, causing it to run out of memory. The createKafka* methods would be code specific for connecting to Kafka, the only JSR-356 specific code would be the above method itself. Contexts and Dependency Injection (CDI) could take advantage of Reactive Streams for event publishing and subscribing, with many use cases similar to the ones described above, but another opportunity for CDI that we think is important is rather something that facilitates not just CDI, but all asynchronous processing in general. The problem comes with CDI implementations using thread locals to propagate context, for example, the context for the current request, which might include the current authenticated user, cached authorization information for the user, etc. The assumption in CDI is that the container will always be in control of the threads that operate within this context. However, with asynchronous processing, that is not the case. A good example of this is in a chat room. Each user connected to the chat room has an active WebSocket request, which has a particular CDI context that goes with it. Processing of messages received from these users might happen in the right CDI context, but what happens when User A sends a message to the chat room, and then it has to be sent to User B? The thread that is propogating the message to User B now needs the request context for User B’s request, in order to correctly handle the message, but that thread will have User A’s request context, because it was the receipt of a message from User A that initiated the current processing. The only answers to this in CDI currently is to not use CDI contexts, rather, to capture all context at the start of the request, and from then on use a non CDI mechanism (such as simply passing the context every manually) to use that context when it’s needed. We think CDI can offer a better solution to this, by allowing context to be captured, and set up/torn down in another thread. Once again, backpressure, completion and error handling is all done for you. In the use cases above, when plumbing streams, there’s often a need to transform the stream in some way, whether it’s a simple map or filter, or perhaps collecting a stream into a single value, or maybe concatenating, broadcasting or merging streams. For Reactive Streams, this functionality is provided by a number of implementations such as Akka Streams, Reactor and RxJava. While these do the job well, it may be desirable for Jakarta EE developers to have common functionality available to them out of the box. Furthermore, a standard library for streaming combinators allows other APIs to use this to provide more fluent APIs to developers than what the bare Reactive Streams Publisher and Subscriber interfaces offer, without having to depend on a third party library. Finally, it would allow Jakarta EE libraries to assume a basic set of streaming operators that they can use in their own implementations, since they could not and should not depend on 3rd party libraries. This is very important, as otherwise the burden of reimplementing many operators would fall into the hands of each and every library wanting to provide streaming capabilities, sidetracking them from the core issue they’re attempting to solve, be it database access, WebSockets or anything else. All of the use cases above only cover changes to existing streaming usages in Jakarta EE, however, adoption of a robust streaming standard like Reactive Streams facilitates new possibilities for features and technologies that Jakarta EE could support. Event sourcing itself may not be that interesting from a streaming perspective, but the ability to consume the event log as a stream of messages is incredibly interesting. Basing the event log stream on Reactive Streams would allow all sorts of consumers to be plugged in, such as message brokers, WebSockets, CDI event publishers, and databases. Applications are tending to provide more responsive user interfaces, with updates being pushed to users as soon as they happen. While WebSockets may offer the mechanism to communicate with the client, Jakarta EE doesn’t yet offer any backend solution for communicating pushes between clusters of machines in the backend. Message brokers can often be too heavy weight to achieve this, and instead a lighter-weight, inter-node communication mechanism would be better. Reactive Streams is the perfect API for building this on, as it then allows seamless plumbing to WebSockets and other stream sinks/sources. Current Jakarta EE features tend to be focussed on short lived transactional processes, which have a definite start and definite end. There is a shift in the industry to more stream based approaches, which is seen in stream processing projects like Spark, Flink and Kafka Streams. Jakarta EE could provide a mechanism for integrating Jakarta EE applications into these pipelines, and Reactive Streams would be the perfect API to offer this integration. In this article we’ve looked at a broad array of possibilities of what Reactive Streams brings to the table for Jakarta EE. Each possibility brings value in its own right, but the more possibilities that are implemented overall, the more value each brings. It’s our hope at Lightbend that we can now start collaborating with the Jakarta EE community in make all of these possibilities a reality. Update: The original version of this blog post was written before the name Jakarta EE was chosen, and referred to EE4J instead.